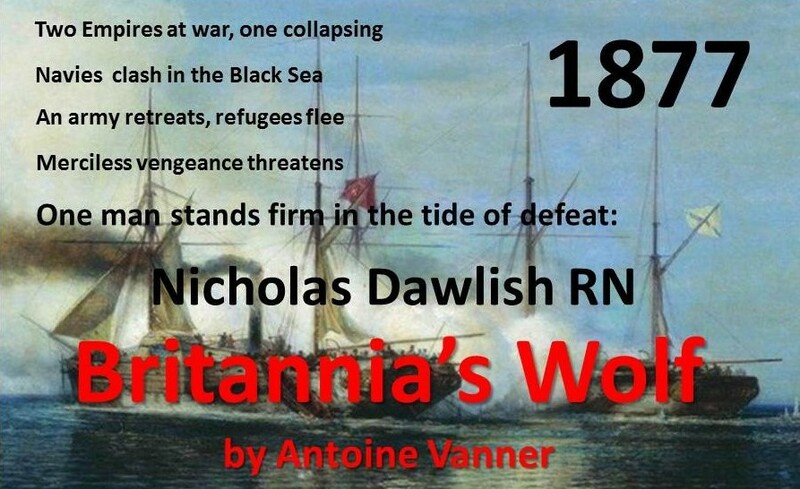 The Spar Torpedo – which plays a vital role in my novel Britannia’s Wolf, the account of Nicholas Dawlish’s service in the Ottoman Navy 1877-78 – was a crude weapon, born of necessity and desperation in the American Civil War. Its use demanded a near-kamikaze commitment from its users, for it was potentially as dangerous to them as to its intended targets. Its lifetime was short – some 20 years – and it was rendered obsolete by the vastly more effective self-propelled “fish torpedo” that remains in service today. Yet for all its drawbacks the spar torpedo remained the only effective way available for a small craft to sink a larger one – and warships were getting significantly larger, and better protected above the waterline, throughout its period of use. The most remarkable aspect of its history is not just that it did indeed score several notable successes, but that in almost every case the crews who deployed it managed to beat the odds and come off relatively unscathed. 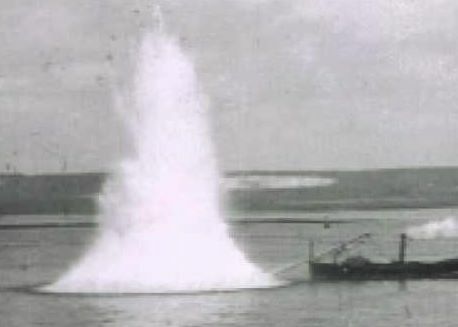 The idea was a simple one – to ram a large explosive charge against an enemy vessel’s hull as deeply as possible below the waterline and to explode it, in the early models by a contact detonator, later by an electric current. Given that high-speed small craft did not yet exist, and that a small steam-driven launch could make at best some six or eight knots, attacks on ships under way in the open sea were ruled out. Moored ships were more appropriate targets but given the slow approach speeds involved the attackers would have to rely on stealth to avoid detection by lookouts or by small craft patrolling the anchorage. 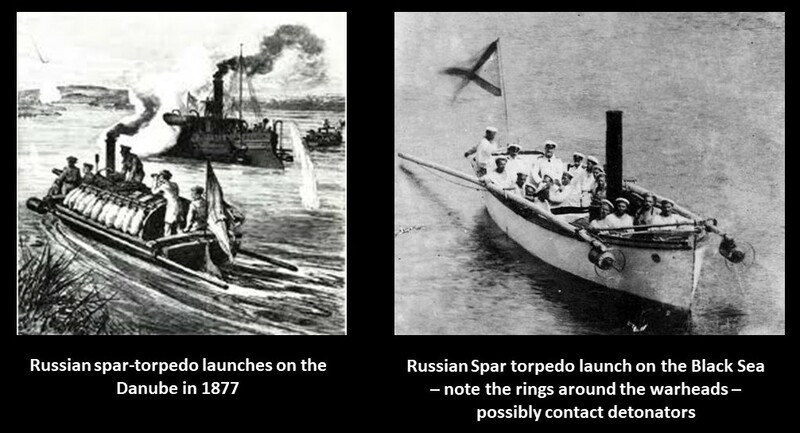 Spar Torpedo test, 1870s – the danger to the attacker is obvious! CSS David: On October 5th 1863 this small, iron, steam-driven cylindrical vessel, which floated practically awash, got within 50 yards of the Union Navy’s New Ironsides on blockade duty outside Charleston harbour before the lookouts detected her. Pressing her attack home the David exploded her charge, badly damaged her target, survived the explosion and limped away to safety. CSS Hunley: Another Confederate near-submarine, but this time propelled by a hand-cranked screw rather than by steam, attacked the Union blockading force outside Charleston on February 17th 1864. In the process the Hunley sank the 1,240-ton screw sloop USS Housatonic but disappeared afterwards, probably swamped by the explosion of her own weapon. Picket Boat No.1: A major concern for the Union Navy was the destruction of the Confederate ironclad CSS Albemarle, which had already held her own against a Union flotilla attacking up the Roanoke River towards Plymouth, North Carolina, in May 1864. 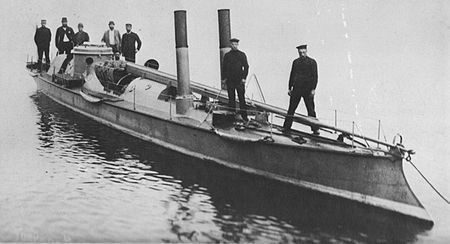 The Union Navy had by now woken up to the potential of the spar torpedo and the task of destroying the Albemarle was entrusted to two steam-propelled 30-foot picket boats commanded by the intrepid Lieutenant William Cushing. 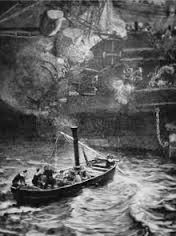 Under cover of darkness on 27th October 1864 his two craft managed to get close to the moored ironclad before being detected but, as rifle-fire erupted, Cushing found that it was surrounded by a boom of floating logs. Charging it, and with the spar deployed, he managed to get Picket Boat No.1 slithering across, then plunged the warhead under the ironclad and jerked the firing lanyard. 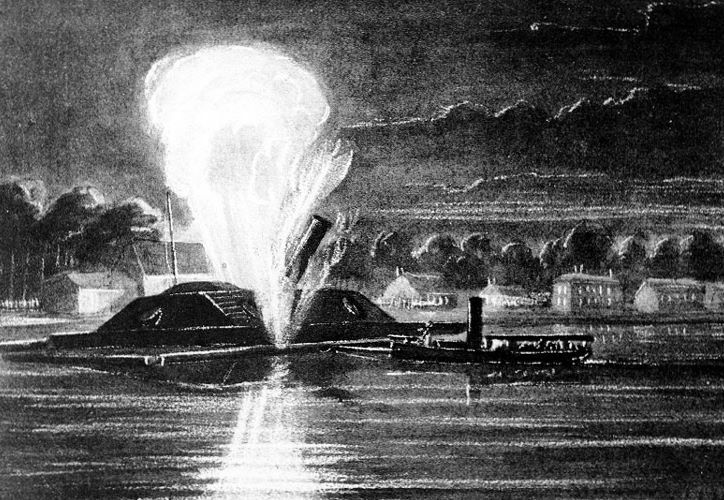 The resulting explosion sank No.1 and blew Cushing and his men into the water but “a hole big enough to drive a wagon through” had been blown in the Albemarle’s side, sinking her into the mud and removing her from the war. Cushing and one other crew-member swam to safety, the others being killed or captured. Russian use 1877: Russia declared war on the Ottoman Empire in April 1877 and commenced operations by sending a large force across the Danube to strike south into Bulgaria. 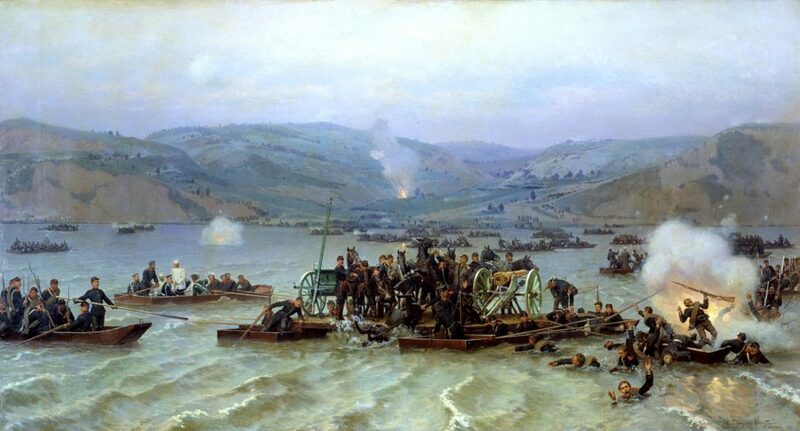 Recognising in advance that the presence of Ottoman monitors on the river would pose a major threat to their lines of communication the Russians transported ten small steam-sloops overland and launched them on the river. Wooden, a mere 20-feet long, their boilers protected by what appear from contemporary drawings to be sandbags, these craft carried out a total of nine attacks with spar torpedoes. In one raid, on the night of May 25th-26th 1877 two Russian craft, the Czarevitch and the Xenia, sank the Ottoman monitor Seifi and two other enemy craft. The Russian casualties amounted to two dead and 10 wounded, and though the tactical victory was impressive the strategic implications were immense. Although Ottoman naval forces continued to operate off the Danube mouth they never again menaced the Russian crossing points upriver. Battle of Shipu: France went to war with the Chinese Empire in 1884 over who should control what is now northern Vietnam. On paper at least the Chinese possessed a modern navy, its ships purchased overseas and with several foreign ‘advisers’, including Germans and Americans, in its service. Despite the latters’ efforts however the Chinese Navy was in practice riddled with corruption and ineptitude and was ill-placed to confront a major European navy. In the aftermath of a failed Chinese attempt to break the French blockade of Taiwan, and an indecisive fleet encounter, the forces of French Admiral Amédée Courbet trapped two Chinese steam frigates, the Yuyuan and Chengqing, which had taken refuge under the guns of Chinese shore batteries in Shipu Bay, about two hundred kilometres south of Shanghai. On the night of February 14th 1885 two French spar-torpedo launches, painted black for camouflage, left their parent ships and manoeuvred their way unseen past junks and sampans moored close to the Chinese warships. They had all but reached their targets before the Yuyuan spotted them, and they came under fire as they pressed their attack home on her. The French exploded their charges and the Yuyuan began to sink. Confused and panicking, Chinese shore batteries blindly opened fire, hitting the other Chinese ship, the Chengquing. The French retreated with only one man killed but both Chinese ships were lost. The sinking of the Yuyuan appears to have been the last time the spar torpedo was used in anger, though there are references on the web, but no details, to an attack on the Chilean central-battery ship Cochrane during Chile’s Civil War of 1891. By then the Whitehead ‘fish’ or ‘locomotive’ torpedo was in general use in most navies and development of high speed craft to launch them was well advanced. In the aftermath of the American Civil War a number of navies had experimented with slim, high-speed craft for delivering spar-torpedo attacks, the most notable being the two Acheron class vessels constructed by Thorneycroft for the New South Wales Naval Service in 1879. Displacing 16 tons, 78 feet long but only 10 feet in the beam, they managed 15 knots and were later modified to carry Whitehead torpedoes. Four roughly similar craft were constructed for the prosaically-named New Zealand Armed Constabulary, in response to fears of raids by Russian cruisers during one of the war scares that characterised the 1870s and 1880s. Obsolete when completed in 1885, they too were armed in due course with Whitehead torpedoes. The Spar Torpedo had had its day. Nobody can have been more relieved than the crews who had been expected to use them. 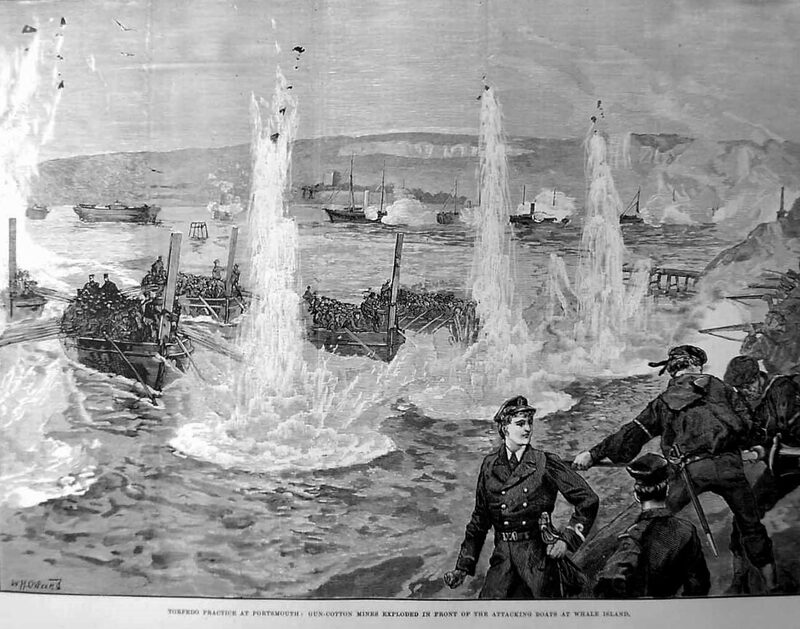 And it you want to read about spar torpedoes being used in action during the Russo-Turkish War then dip into “Britannia’s Wolf”, available in Paperback, Kindle or Audio Formats. Click on the image below for further details.